Manchester City's Leroy Sane returns to the Germany squad for next month's matches against France and Peru, but there is no place for Juventus midfielder Sami Khedira. 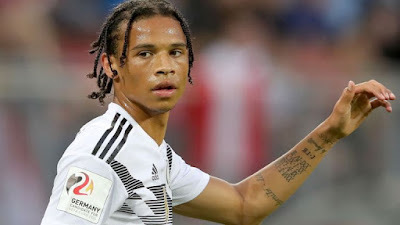 Sane was a surprise omission from the squad that, as holders, crashed out of the World Cup in the group stage. "I spoke to Leroy on that day [of the World Cup squad announcement]", coach Joachim Low told a news conference. "I told him that his national team future must begin after the World Cup, that we are aware of his qualities. "It's important to have a good core. We need it for younger players to look up to," he said. "I am convinced they can show much, much more [than they did at the World Cup]. They are all class players." Three uncapped players -- Paris Saint-Germain defender Thilo Kehrer, 21, Hoffenheim wing-back Nico Schulz, 25, and 19-year-old Bayer Leverkusen midfielder Kai Havertz -- have been selected. "They are three very young, highly talented players. It's a mix of experience and youth," Low said. Goalkeepers: Manuel Neuer (Bayern Munich), Marc-Andre ter Stegen (Barcelona). Defenders: Jerome Boateng (Bayern), Matthias Ginter (Borussia Monchengladbach), Jonas Hector (Cologne), Mats Hummels (Bayern), Thilo Kehrer (PSG), Joshua Kimmich (Bayern), Antonio Rudiger (Chelsea), Nico Schulz (Hoffenheim), Niklas Sule (Bayern), Jonathan Tah (Bayer Leverkusen). Midfield/Attack: Julian Brandt (Bayer Leverkusen), Julian Draxler (PSG), Leon Goretzka (Bayern), Ilkay Gundogan (Manchester City), Kai Havertz (Bayer Leverkusen), Toni Kroos (Real Madrid), Thomas Muller (Bayern), Nils Petersen (Freiburg), Marco Reus (Borussia Dortmund), Leroy Sane (Manchester City), Timo Werner (RB Leipzig).